In a previous article on recent "man track" claims I remarked that among some creationists, little if anything seems to have been learned from past mistakes (Kuban, 1989). Reinforcing this conclusion are claims of "humanoid" tracks from Arizona in a two- part, 1989 Ceation Research Society Quarterly Report (Rosnau, 1990a, 1990b). The CRSQ report did not promote human track claims as dogmatically as many previous creationist works, and three of the report authors (J. Auldaney, G. Howe, and W. Waisgerber) expressed doubt about some of the markings. However, the report as a whole strongly encouraged human track interpretations based on evidence just as questionable as that in many early Paluxy works. The report also presented a misleading history of the Paluxy controversy, and reflected serious problems in the team's approach and methodology. In a similar but shorter article in The Ark Today, Paul Rosnau, the fourth author of the CRSQ report, flatly calls many of the markings "man tracks" (Rosnau, 1990c). The two sites in question, designated Site 1 and Site 2 by the CRS team, are located near Tuba City, Arizona. Site 1 is adjacent to a well known dinosaur track site (directions are found in the CRSQ report), which Ron Hastings and I inspected in 1988. Site 2 is reportedly about 3 km away, but its exact location has not been disclosed. Although the CRSQ authors indicated that directions will be supplied upon request to "responsible researchers," so far my own requests have been denied. Accounts of how the "humanoid" prints were "discovered" vary between the CRSQ and The Ark Today reports, but evidently those at Site 1 were first found by Rosnau and/or other creationists in 1984. Those at Site 2 evidently were found in the late 1960's by Earl Cummings, and were later visited and publicized by Rosnau in 1985. The sites reportedly occur in the Kayenta Formation of the Glen Canyon Group, which is part of the Colorado Plateau. The CRSQ report correctly states that the Glen Canyon Group is generally considered upper Triassic or lower Jurassic, but incorrectly states that such strata are presumed to have been deposited "from 175 to 100 million years before present." The actual mainstream date range for the strata is approximately 200 to 175 million years before present. Early in the CRSQ report the authors give a list of many countries and U.S. states where human tracks or artifacts have been reported from Mesozoic sites. Without any review of the validity of these reports, the statement is made that "such a vast array of evidence is in itself impressive." However, a lot of unsubstantiated evidence does not amount to good evidence, even if some Paluxy "man track" advocates seemed to have operated on this basis. Most of the alleged human tracks in the CRSQ list have been refuted or questioned even by creationist researchers, including former CRS present Wilbert Rusch (1971). The CRSQ authors quote Rusch as saying that among creationist there is an excessive willingness to jump to unjustified conclusions on this topic, and yet fail to heed his advice (or their own admonishments about objectivity) throughout the report. They also fail to they mention that Rusch himself refuted many of the same evidences the CRSQ calls "impressive." The history of the Paluxy controversy and the Taylor Site evidence as given in the CRSQ report was very deficient, and reflected many of the misunderstandings still common among creationists. For example, the report implied that I began my work on the Taylor Site in 1984, and that the dinosaurian interpretation of the Taylor Site tracks relied on "color patterns" I found at that time. Actually, I began an intensive study of several Paluxy sites in 1980, and by the fall of the same year concluded that the Taylor Site tracks were elongate dinosaur tracks whose elongation was due primarily to metatarsal impression--based on evidence apart from the colorations (which were not yet recognized--discussed further below). Even earlier, in the early 1970's, a team of creationists from Loma Linda University (who published in 1975) also concluded that the tracks were dinosaurian based on indications of dinosaurian digits and other features apart from the coloration features, though they missed the metatarsal aspect (Neufeld, 1975). This important early work by the Loma Linda team was not mentioned by the CRSQ authors. The independent recognition of the coloration and associated infilling features in 1984 by Ron Hastings and myself provided further confirmation of the dinosaurian nature of the tracks. Contrary to the implications of the CRSQ report, such features are not merely "stains," and their authenticity is well supported and carefully documented. I and other workers have discussed these phenomena in published articles (Kuban, 1986a, 1986b, 1986c; Hastings, 1987), which provide extensive evidence for the natural origin of the colorations and associated features, offer a plausible infilling model, and demonstrate that the dinosaurian interpretation is well supported by evidences apart from the coloration/infilling features (summarized further below). Since none of this was mentioned in the CRSQ report, it seems ironic that the authors accuse me of not adequately dealing with the evidence. After listing past creationists that supported the human track claims, the authors suggested that Stan Taylor's film Footprints in Stone (Taylor, 1973) "authenticated the tracks," which is potentially misleading, since 1. Taylor's company withdrew the film in 1986 in the wake of extensive evidence against the film's claims, and 2. the dinosaur tracks were authenticated by mainstream scientists long before Taylor's work. Curiously, no credit was given to E. W. Shuler, R. T. Bird, or other early mainstream workers who first documented the biped and quadruped dinosaur tracks in the Glen Rose area (Bird, 1985). That Taylor's film and John Morris' book were discontinued was mentioned later in the report; however, the authors failed to clarify that many others workers who once supported the human track claims have since abandoned or questioned them, and that some creationist researchers (such as the Loma Linda team, Wilbert Rusch, and Ernest Booth) never accepted them in the first place. The CRSQ statement that the Paluxy strata are "known to exhibit walking sequences of tracks with man-like strides" is also potentially misleading, since both humans and bipedal dinosaur trackways have left-right strides, and the alleged "man tracks" in the Paluxy that are in trails of any kind fit dinosaur stride patterns better than human ones. Other "man tracks" in the Paluxy include erosional features and ambiguous markings that are not even in natural striding trackways. The CRSQ report indicated that I argued that the Taylor Site tracks were made by a dinosaur that traveled in a quasi- plantigrade manner. "Plantigrade" is a term indicating a creature walking with weight on its soles and heels, rather than its toes alone. One important point the authors did not clarify is that the tracks are definitely metatarsal dinosaur tracks (reflecting impressions of the dinosaur's soles and heels), whether or not such impressions were plantigrade or quasiplantigrade (Kuban, 1989a) in terms of representing a regular or normal locamotor mode. Indeed, the CRSQ statement that the "quasi-plantigrade" concept is in need of "honest review" seems somewhat misleading, since the metatarsal dinosaur track concept and its relevance to the Taylor Site tracks in particular, has been extensively reviewed and well accepted among paleontologists, as well as most serious creationist workers. Normal peer review took place before my presentations at the First International Symposium on Dinosaur Tracks and Traces, held in Albuquerque, New Mexico in 1986, where I presented two papers on my track work. During the conference and afterward numerous paleontologists responded largely positively to my work and conclusions. The papers were subsequently published om the book Dinosaur Tracks and Traces (Kuban, 1989a, 1989b) leading to further support of my conclusions by conventional earth scientists as well as many creationists. In contrast, the CRSQ's humanoid track interpretations at Arizona sites has not been well accepted by either mainstream or most creationist groups. In an apparent attempt to downplay the metatarsal dinosaur track phenomena, the CRS team failed to mention that such dracks are not limited to the Taylor Site; they occur on other Paluxy sites, other parts of Texas, other areas of the U.S., and other countries (Kuban, 1986a). Thus, such tracks are not nearly as unusual or rare as the report implies. Likewise, color distinct and infilled tracks have been found in several other areas, including New Mexico, Colorado, Virginia, and other sites in Texas (Kuban, 1986b). The report also implied that the dinosaurian color and texture distinctions were not present when the Taylor Site tracks were first exposed. Actually, as explained in previous articles, there is abundant evidence that these features were present (but overlooked, and perhaps less vivid), on at least some of the tracks since their first exposure. Such features can be seen in some of the earliest creationist photos and film from the site, which has been acknowledged by Paul Taylor and John Morris. [ ] In previous reports I listed several factors contributing to the features having been missed originally, and explained that the color vividness does change somewhat with degree and type of exposure. In view of this and other evidence discussed below, it was misleading for the CRSQ team to imply that the colorations only recently appeared, or state that "No one has satisfactorily explained why the tracks change color over the years following exposure." While focusing on alleged but unfounded mysteries about the coloration features, the CRSQ article neglected many other aspects of the Taylor Site tracks which strongly support the dinosaurian interpretation and the genuineness of the coloration/infilling patterns. No mention was made of the textural and compositional differences between the track material and the surrounding substrate (indicating that the tracks are infilled with a secondary sediment), nor of core samples that show the infilling boundary well into the subsurface, which further confirms the genuineness of the colorations (Kuban, 1986a). The report also gave an inaccurate description of the colorations--and falsely attributed the description to me. The colorations are not merely "tridactyl pointed toes with colored patterns along the leading edges" (a misconception originated by John Morris), but extend throughout each track, and vary from blue-grey to rust brown (the blue-grey represents the original infilling material; the rust evidently represents oxidation on the surface of the bluish material). Nor were the important track features of wide anterior splaying and shallow tridactyl depressions on several tracks mentioned, even though they also confirm the dinosaurian origin of the tracks. The CRSQ report asserted that a Time article (June 30, 1986) about my work was printed "without rebuttal." However, John Morris, who wrote Tracking Those Incredible Dinosaurs--once considered the definitive creationist work on the subject--was interviewed for the article and quoted in it; he just had nothing substantial to say in behalf of the "man track" claims. Nor does Morris or his organization still advocate such claims, so one must wonder what sort of rebuttal the CRS team expected Morris to make. The CRSQ authors further muddied the Paluxy waters by implying that I did not address other Paluxy "man track" sites. In fact I and others have literally spent years scarefully studying, mapping, and reporting on other Paluxy sites where human tracks have been claimed, and in each case found no convincing evidence of human prints there. Moreover, even past "man track" advocates such as John Morris have acknowledged that the "man tracks" on these other Paluxy sites are in question, and should not be used as evidence against evolution (Morris, 1986). It also is ironic, in view of the team's mistreatment of legitimate studies on the issue, that they praised the work and of Carl Baugh, whose claims and activities in the Paluxy have been fraught with serious problems, as many creationists recognize. For example, the "human" tooth promoted by Baugh and the CRSQ has been conclusively shown to be a fish tooth (Hastings, 1989). In 1989, in the face of overwhelming evidence, Baugh himself acknowledged that it was not human, although he and others have since made some suggestions that the issue may not be settled, while offering nothing further to support the human tooth claim. Many of the problems in the CRSQ report might have been avoided if the team had more thoroughly studied the past literature on the subject--from all sides. Much of the early (and even recent) creationist literature on the Paluxy controversy contains inaccurate information; however, many recent writings by Hastings, Farlow, me, and others have clarified the Paluxy evidence in detail. Many problems also may have been avoided by allowing critical workers (in the positive sense) and/or professional paleontologists to review the CRSQ articles before publication. Especially puzzling is why the CRSQ team not take advantage of the expertise and assistance of the only person who (as far as I know) was the only professional, young-earth-creationist paleontologist in the U.S. at the time: Kurt Wise. To my surprise I learned that not only was Wise not invited to assist in the project, but when Wise took the initiative to offer his assistance, it was rejected. The team initially expressed interest in my participation, but after I expressed serious doubts about their interpretations when shown Xerox copies of some site photographs, the team's interest in my involvement seemed to vanish. Many of the problems in the approach, methodology, and documentation of the CRSQ team are similar to those that plagued early creationist Paluxy studies and writings. Several general problem areas are outlined below, followed by specific examples. 1. Ambiguous depressions were often referred to as "tracks" or "prints" before they were conclusively demonstrated to be such. This was done throughout the CRSQ report with the rationale that it was "convenient." However, proper terms are no less convenient than improper ones, and avoid presumptions (the features in question should be referred to as markings, depressions or features, until their status is well established). 2. Even the "best" individual markings in the CRSQ report show at most a superficial resemblance to human prints. Bottom contours appear incompatible with genuine human tracks. Supposed "toes" are either unclear not in normal or consistent human shapes and positions. Problematic features were often neglected. 3. Despite suggestions to the contrary, none of the photos or maps shows a natural striding sequence. The "best" alleged series appear inconsistent in step length and direction, and the individual markings are not consistent or distinctly human in shape and detail. Supposed tracks and trails do not stand out readily from many other ambiguous markings distributed in a helter skelter fashion around them. 4. Trackway maps are woefully inadequate, failing to show accurate track shapes (or any shapes at all), and omitting potentially significant markings not interpreted as human prints. 5. Alternate explanations are not adequately explored. The authors conceded that some of the markings might be concretions, but this and other possible causes for many of the marks were hastily dismissed. 6. Reviews by critical workers and professional paleontologists were largely lacking. Compounding these problems were the non-rigorous criteria used by the CRSQ team in judging whether the tracks were "humanoid" or "humanlike." The authors listed several "suggested" characteristics that a human print should possess, most of which were overly loose and ambiguous. For example, they stated that the "print" should be "shaped like a human foot," but do not state what specific features or aspects of its shape are important for assessing a significant "likeness." They also state, "The print manifests some internal detail suggestive of human toes or toe marks," rather than requiring specific detail, clarity, and positions of these and other print elements. In order to reliably demonstrate that a marking is human or even probably human, several rigorous criteria should be met. These include, but are not limited to: 1. At least three (preferably more) individual markings in a natural striding sequence, 2. A consistency of size, shape, and bottom contours (itemized under point 3) in the individual markings of the sequence, 3. Distinctly human--not just oblong--outlines and bottom contours, exhibiting properly shaped and positioned heel, arch, ball, raised ridge between ball and toes, and individual toe markings (or at least toe trench), with proper decrease in toe size and proper angle of the toe line--with such features appearing on most of the prints in the sequence, 4. Reliable information on the history of the site since its exposure (to eliminate the possibility of any deliberate or accidental alteration of the markings). There are other criteria that are often helpful in judging a marking, but these at a minimum these should be met before a marking is considered human or even probably human. Even when all these criteria are met, the trackways must be documented with clear photographs and accurate, detailed maps. None of the CRSQ markings appear to meet these important standards, and most fail by any one of the first three criteria. Space does not permit discussions of all of the markings in the CRSQ articles, but it will be instructive to review some specific examples. Markings shown in Figures 1 and 2 (a photo and drawing respectively) of the report supposedly show an overlapping "juvenile hand and foot" print, and Figures 3 and 4 show a so- called "possible skid track of a human hand." Neither marking is associated with a trackway, and one can see from the photographs that the markings are very ill-defined. Indeed, they barely have any resemblance to human hand and foot prints, and no evidence was offered that they are anything more than natural irregularities or inorganic features of the substrate. The drawings presented with the "prints" seem more misleading than helpful, since they show detail not clear in the rock itself, and omit various features that are visible in the rock. (Coincidentally, Paluxy "man trackers" Cecil Dougherty and Carl Baugh promoted other vague markings as human "hand prints"). Figures 5 and 6 of the report show a reputed "double impression" and even "toes" but the features of the marking are not in normal human shapes or positions and the bottom contours actually contrast those of human prints. Neither "print" is a natural striding sequence. Again, such claims are reminiscent of past Paluxy claims; Taylor and others identified "overlapping prints" among various erosional features on the State Park Shelf. Claiming or even suggesting human tracks on the basis of this kind of evidence amounts to finding faces in the clouds. The practice should have been abandoned long ago by creationists. As another example, the CRSQ report claimed that "track 15" in Figure 8 "clearly resembles the print of a shod human print." Besides not being in a normal striding sequence, it appears as a curved oblong depression lacking any clear or diagnostic human features (even a shod human print should show relatively greater depression at the ball and heel). Accepting such a small "resemblance" to human prints (or calling it "close" resemblance) is essentially meaningless, since almost any highly eroded or irregular surface will contain similar features. The conclusion on p. 78 of the CRSQ report that "22% of the markings were shaped like a human foot" is also largely meaningless in view of the very loose manner in which such similarity was judged. The above statistic also suggests more work is needed to explain the origin of the many nonhuman markings and their possible relationship to the alleged "humanoid" ones. The CRSQ report also referred to possible sheep tracks at Site 2, and pictured a marking said to "closely resemble" a sheep track. However, no natural, striding trails of such marks were documented, and the pictured marking consisted merely of two small elongate marks. Such a simple pattern could easily have alternate explanations. Directly across the page from the so- called "sheep track" was a photograph showing fossil claims of about the same size and shape. Whether such clams were the cause of the "sheep track" is unclear. What is clear is that the CRSQ team did not apply rigorous criteria in their evaluations, and failed to sufficiently explore alternate explanations. Supposed humanoid prints near Tuba City, AZ. (Photo linked from Doug Sharp's web page at http://www.rae.org/tuba.html). A 1999 website article by Doug Sharp shows several photographs of purportedly human-like tracks from the Tuba City area. The photos show a variety of oddly-shaped stones with undulating surfaces in the area, some of which are oblong and (at best) roughly human-like. Many others are not. Sharp makes comments about how this or that specimen can be viewed as somewhat human like, and implies near the end of the article that those who do not conclude they are in fact human prints have evolutionary bias. However, considering the lack of distinct human features in these markings, and the absence of clear and natural striding sequences, Sharp might to well to reconsider his own objectivity. Indeed, Sharp seems to play the same game formerly engaged in my some Paluxy advocates: searching out roughly human-like features from countless similar geologic features that are clearly nonhuman, and suggesting the former are good candidates for human prints. While this may exercise one's imagination, it is hardly good science. Further revealing his misunderstanding of how to properly evaluate possible geologic anamolies, Sharp writes: "We do not have to establish an absolute incontrovertible case in order for us to conclude that humans could have made these tracks. We only have to establish that the hypothesis is reasonable." However, extaordinary claims do require extraordinary evidence. Arguing whether humans "could" have made such ambiguous markings is subjective at best; unless the markings were clear, they also "could" have been made by a number of other phenomena. Only demonstrating that they were made by humans would support strict creationism. And to do that, and in the process overturn conventional geology, one would indeed need incontrovertable evidence. In this case, that would mean distinct human prints in natural striding sequences, not a smattering of roughly ovoid ruts and smudges. Certainly Sharp would not accept similarly vague markings to serve as pro-evolutionary evidence (note that many of the dinosaur tracks are clear and unambiguous). To suggest that creationist evidence can be less rigorous does not help his case or overall credibility. When Ron Hastings and I visited Site 1 in 1988 we saw many definite bipedal dinosaur tracks nearby (as I had during a previous trip), but nothing that strongly resembled a genuine human footprint. The so-called "humanoid" markings looked no more convincing in person than they later did in the CRSQ photographs. The CRSQ report did not begin explain how multiple dinosaur track layers fit their young-earth, Flood geology model. A crucial question is how these and many other vertebrate track layers (like those in the Glen Rose Formation) were formed during the midst of a violent worldwide Flood--if indeed such layers are interpreted as Flood deposits. Particularly in need of explanation is how the track-makers survived while thousands of feet of sedimentary material were being deposited under the track layers or while extensive sediments between the track layers were being deposited. The severity of this problem in relation to the Colorado Plateau is discussed in a recent article by paleontologist Stephen Godfrey (1989). It is ironic that the CRSQ authors criticized other work as being biased and incomplete and urge other creationists to be "studious and completely objective," yet commit many of the same errors they criticize. I hope that in any future work by the CRSQ team there will be less rhetoric about, and more demonstration of, objectivity and scientific rigor. Farlow, James O. 1987. A Guide to Lower Cretaceous Dinosaur Footprints ad Tracksites of the Paluxy River Valley, Somervell County, Texas. South Central G.S.A and Baylor University. Godfrey, Stephen. Winter 1989-1990. Tetrapod fossil footprints, Polonium Halos, and the Colorado Plateau. Creation/ Evolution, Vol. 26, pp. 8-17. Hastings, R. H. 1987. New observations on Paluxy tracks confirm their dinosaurian origin. Journal of Geological Education, Vol. 35, pp. 4-15. Hastings, R. H. 1989. Creationists' "Glen Rose Man" proves to be a fish tooth (as expected). National Center for Science Education Reports, Vol. 9, No. 3, pp. 14-15. Kuban, Glen J., 1986, The Taylor Site Man Tracks. Origins Research, Vol. 9, No. 1, pp. 1-9. Kuban, G. J., 1986. "A Review of ICR Impact article 151." Origins Research, Vol. 9, No. 1, pp. 1-12. Kuban, G. J., 1986. A summary of the Taylor Site evidence. Creation/Evolution, Issue 17, Vol. 6, No. 1, pp. 10-18. Kuban, Glen J., 1986d, Color Distinctions and Other Curious Features of Dinosaur Tracks Near Glen Rose, Texas. In: Gillette, David D. and Martin G. Lockley, eds., Dinosaur Tracks and Traces, 1989, Cambridge Univ. Press, Cambridge, p. 427-440. Kuban, Glen J., 1989, A Matter of Degree: An Examination of Carl Baugh�s Credentials. National Center for Science Education Reports, Vol. 9, No. 6, p. 15-20. Kuban, Glen J., 1989, Retracking Those Incredible Man Tracks. National Center for Science Education Reports, Vol. 9, No. 4 (Special section). Miller, Wade E., Britt B. Brooks, and Kenneth L. Stradtman. 1989. Tridactyl tracks from the Moenave Formation of Southwestern Utah. In: Dinosaur Tracks and Traces, David Gillette and M. Lockley, 1989, Cambridge University Press, pp. 210-211. Neufeld, B. 1975. Dinosaur tracks and giant men. Origins, Vol. 2, No. 2. The only mention of the Loma Linda work in the CRSQ report was in connection to carvings. Rosnau, Paul O., J. Auldaney, G. F. Howe, and W. Waisgerber. 1990. 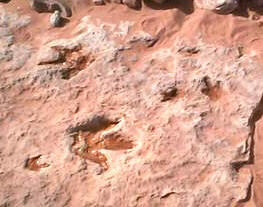 Are human and mammal tracks found together with the tracks of dinosaurs in the Kayenta of Arizona? Part I: A History of research and Site description. Creation Research Society Quarterly, Vol. 26, No. 2, pp. 41-48. Rosnau, Paul O., J. Auldaney, G. F. Howe, and W. Waisgerber. 1990. Are human and mammal tracks found together with the tracks of dinosaurs in the Kayenta of Arizona? Part II: A History of research and Site description. Creation Research Society Quarterly, Vol. 26, No. 3, pp. 77-98. Rosnau, P. 1990. Evidence of Man-Dinosaur coexistence. The Ark Today, Vol. 5, No. 2, pp. 8-9. Rusch, Wilbert H., Sr., 1971. Creation Research Society Quarterly, Vol. 7, No. 4, p. 201-213. Taylor, Stan T. 1973. Footprints in stone. (16 mm film) Produced by Films for Christ Association, Mesa, AZ. Time magazine, June 30, 1986, Vol. 127, No. 26, p. 75. Wise, Kurt. Telephone communication, 1990.